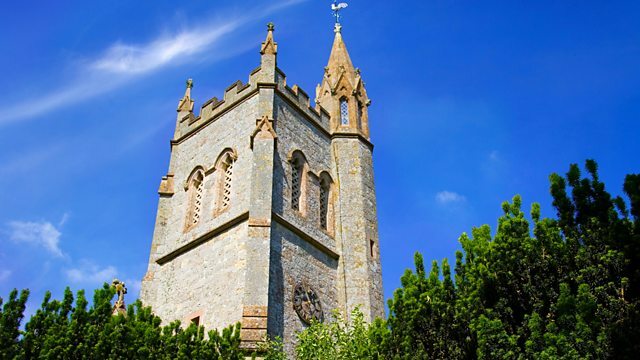 A service from St Arvan's Parish Church, Chepstow, exploring the theme of Faith and Transformation, based on the lives of the apostles Peter and Paul. Preacher: Fr Michael Gollop. A service from St. Arvan's Parish Church, Chepstow, exploring the theme of "Faith and Transformation" based on the lives of Peter and Paul. Readings: 2 Timothy 4: 6-8; 17-18. Matthew 16: 13-19. Preacher: Fr. Michael Gollop. Cantemus Chamber Choir, Wales. Musical Director: Huw Williams. Organist: Peter King. Cello: Kathryn Price. PLEASE NOTE: This script cannot exactly reflect the transmission, as it was prepared before the service was broadcast. It may include editorial notes prepared by the producer, and minor spelling and other errors that were corrected before the radio broadcast. Welcome to the parish of St Arvans. We are a small community at the lower end of the Wye Valley. There’s been a Christian community and a Church on this site since well before the ninth century; tradition says our patron saint was a Celtic hermit who lived and gave witness to Christ here on the banks of the River Wye. As we gather for worship this morning our hearts go out to the people of South Africa, keeping vigil for Nelson Mandela. Today we celebrate the feast day of Saints Peter and Paul, apostles of Christ, sent to proclaim the Good News, without whose witness we wouldn’t be here today; Peter, chosen by the Lord to be the leader of the flock, the rock, on whose confession of faith the Church is established; Paul chosen to take the Gospel to the ends of the known world; both of whom, by giving their lives for their master, made the supreme act of love and faith to the person of the Risen Christ. We pray that, aided by their prayers and their example of holiness, we too, with courage and faith, may follow the Lord in all that we say and do and are. How lovely are the Messengers. As for me, I am already being poured out as a libation, and the time of my departure has come. I have fought the good fight, I have finished the race, I have kept the faith. From now on there is reserved for me the crown of righteousness, which the Lord, the righteous judge, will give to me on that day, and not only to me but also to all who have longed for his appearing. But the Lord stood by me and gave me strength, so that through me the message might be fully proclaimed and all the Gentiles might hear it. So I was rescued from the lion’s mouth. The Lord will rescue me from every evil attack and save me for his heavenly kingdom. To him be the glory for ever and ever. Amen. Based on an ancient monastic text from Ireland, the hymn, Be Thou my Vision, speaks of a wholehearted commitment to God. A reading from the Holy Gospel according to Matthew, chapter 16 beginning at verse 13. R/ Praise be to thee, O Christ. A question lies at the very heart of today’s celebration – a question directed to all of us. Questions can be difficult to cope with, they challenge us, they stretch us and sometimes force us to deal with things we would rather not contemplate. The answers, too, can be surprising. I remember a few years ago while taking part in a parish mission having to introduce a group of Franciscans to a local school assembly. I made the mistake of asking the crowd of children – who do you think these people are? ‘Monks’ came back the answer and then I made the fatal error – ‘well…. maybe, but what sort of monks. ‘Chipmunks’ came an anonymous voice from the back of the hall. It broke the ice certainly, but I’m not sure we quite recovered our equilibrium, or the head teacher from his embarrassment. It wasn’t the answer we had been expecting – and not in a good way. Quite unlike the response Peter gives to Jesus when in the Gospel reading the apostles are asked the most challenging question of all. Jesus begins by making a general enquiry about what people are saying about him and after receiving an answer puts them on the spot by asking them ‘yes, but who do you say that I am? One can imagine each of them looking around at one another – What do I say? What do I think? And it’s Peter, in some ways the most unlikely candidate, who comes out with the profound answer – it comes from the heart ‘You are the Messiah, the Son of the living God.Peter, the impulsive fisherman, rash to the point of recklessness, slow to catch on, someone who learns the lessons of faith, like most of us do, the hard way, produces the confession of faith which Jesus was looking for but hardly expects. And it’s clear that in response to the answer of both men, the Lord tells them who they are. Simon becomes Peter, the Rock, the leader of the apostles; Saul becomes Paul, the bringer of the Gospel message to the nations of the world. probably within a year of one another. But there’s much more to this apostolic double-act even than a matter of geography. The Church needs both Peter and Paul. Like Peter we need to hold on to what Christ taught, and how the apostles themselves, our human link to the Risen Lord, understood what he did, that he was God incarnate and that his coming among us is of supreme importance for our understanding of God himself and of ourselves as human beings. And like Paul, we have to emphasise that the Church exists for the proclamation of the faith; that the Church’s task is always to go out to the various cultures and societies of the world and proclaim the Good News of the Resurrection fearlessly and boldly. We need Peter and we need Paul as reminders to us all of the Church’s two-fold task - to hand on authentically what was received from the Lord and the need to preach and teach and convert and not to be afraid. We need their example and their prayers in all the challenges Christians have to face in today’s world. We need Peter & Paul to set before us the breath-taking reality that Jesus of Nazareth, is truly the Son of the Living God; and that he has established a community of friends who are, by their communion with him, adopted sons and daughters of God. We are all called into this living personal friendship with Christ. A setting of George Herbert’s The Call from Five Mystical Songs by Ralph Vaughan Williams. The lives of both Peter and Paul were utterly transformed by their encounter with Jesus. They were both called, both “converted” and this conversion, as it does for all of us, continues throughout their lives as part of their growth in knowledge of God and their service of the Lord Jesus Christ. Both were transformed by a personal encounter with the living Lord. I suppose we could say that St Paul’s experience falls more neatly into what we might call these days the category of a ‘conversion experience’ – sudden dramatic, life-changing. I know of a friend who, while working abroad in South America, went into the office very early one morning and in the stillness before the beginning of the working day had an encounter with the living God so profound that it changed his life for ever. My own experience is that, having rejected the faith as a teenager, through a series of chance meetings and loaned books, I came to a similar realisation of the reality of God while clearing snow on a cold and brilliantly starlit night. Everything fell into place. But people come to Christ in different ways – for some of us it can be dramatic, earth-shattering, instantly transforming, but the call can also come through a life lived in the company of the Risen Lord, gradually, hesitatingly, stumblingly, - as the grace of God, and the need for his mercy and forgiveness become part of who we are. The two Apostles we celebrate today handed on the faith that has been lived down the centuries and across the nations. This is the same faith that we try to live each day. Yet however we come to hear that essential question – who do you say that I am? - we are called to a constant and ongoing conversion of mind and heart. It would be easy to say that we know the answer, or even that the question isn’t directed at us at all, because of the clear witness of those who have gone before us marked with the sign of faith. But Christ never really asks us for a ready-made answer, for a formula, however tried and tested, which is not also part of who we are; he asks us what we ourselves believe about him. The Italian saint, Philip Neri said that he was converted to Christ, not just once but every morning of every day and that has to be true for all of us who live in friendship with Christ. Who do you say that I am……? The Lord Jesus built his Church on the faith of the Apostles. United with them, in fidelity to the Gospel's teaching and way of life, we now present our needs to God our heavenly Father. For the poor and the oppressed, and those who live in war-torn parts of the world, especially for the people of Syria & Egypt. "For the people of South Africa as they pray for (their critically ill) former President Mandela, and for his family, that his legacy may continue to be honoured; and for us all, that we may follow his example in seeking both truth and reconciliation in our own hearts and in our lives...... "
Joining our prayers with Mary the Mother of God, the holy Apostles, Peter and Paul and all God’s holy ones, we bring our own concerns to the Father... And as we do so we listen to a meditation on the need to respond to the love of God by Rabbi Neil Comess-Daniels…… entitled in Hebrew, Adonai S’fatai. ‘Eternal God open my lips. That my mouth may declare Your glory." Our final hymn tells of the communion of saints; in Christ, a fellowship not bound by space or time. Ye Holy Angels Bright. which he built upon the rock of Peter's faith. May he bless you with a faith that never wavers. Amen. through the labours and preaching of Saint Paul. by the manner of your life. Amen. which Peter gained by his cross, and Paul by the sword. Amen. And just a reminder that BBC Radio 2’s Young Chorister of the Year competition is currently welcoming entries – full details can be found on the Radio 2 website.